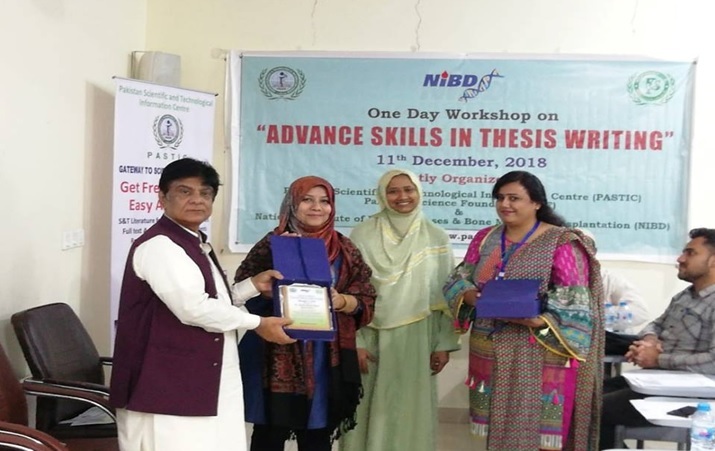 Workshop on "Advance skills in Thesis Writing"
PASTIC Sub Centre Karachi organized a one day Workshop on "Advance skills in Thesis Writing" on December 11, 2018 at National Institute of Blood Disease & Bone Marrow Transplantation, jointly organized by PASTIC, Pakistan Science Foundation & National Institute of Blood Disease & Bone Marrow Transplantation. 32 Participants from different universities i.e NIBD, University of Karachi, Jinnah Sindh Medical University, Iqra University, Aga Khan University, Federal Urdu University etc. attended the Workshop. A presentation was delivered by Dr. Syeda Sadaf Akbar, Resource Person from Dadabhoy Institute of Higher Education on Thesis Writing. In the closing session, Dr. Sadaf Shahab, Associate Professor, Focal Person from National Institute of Blood Disease & Bone Marrow Transplantation was Chief Guest of the Workshop. Deputy Director PASTIC Sub Centre Karachi presented Shield to Resource Person during One day Workshop on "Advance skills in Thesis Writing".